The curry does take a little time to prepare, but the results are worth it. 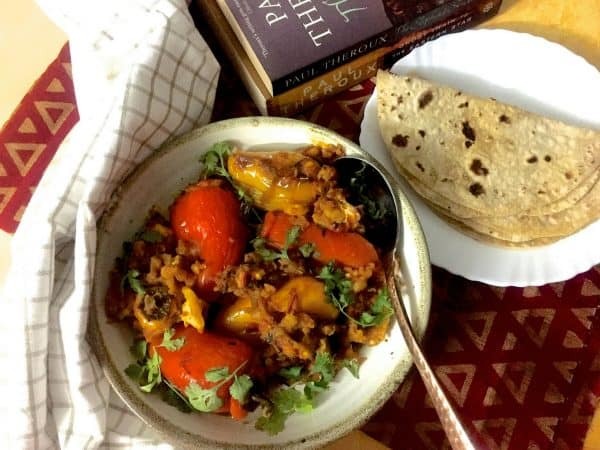 I have divided the recipe into 2 parts to make it easy – first prepare the stuffing, which is a simple aloo chokha or mashed potato, and stuff the capsicum and grill/saute it. Then make the gravy and add the stuffed pepper to it and let it cook in the gravy. 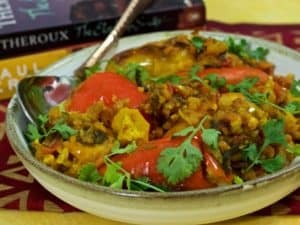 When making this Stuffed Shimla Mirch or Bharwan Shimla Mirch, select peppers as evenly sized as possible, and preferably those with fewer contours to make stuffing easier and for them to cook evenly. 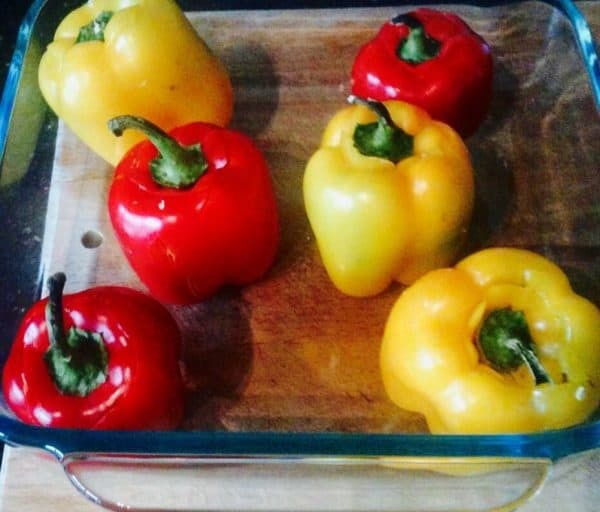 You could plan the number based on the number of servings, and if you use small sized capsicum or peppers, you could serve them whole along with a little gravy on each plate, rather than try to slice them at the table which becomes messy. 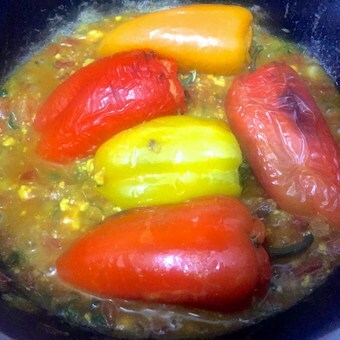 Earlier I used to fry the stuffed capsicum, but now becoming more health conscious, I prefer to grill them instead and then lightly sauté them in a little oil for 5 minutes, before adding them to the gravy. You may even skip this step and add the grilled stuffed capsicum to the gravy directly and let the gravy coat and cook them soft. Stuffed Shimla Mirch or Bharwan Shimla Mirch - grilled capsicum or coloured Bell Peppers deliciously stuffed with mashed potatoes & cooked in a creamy gravy of onions and tomatoes. Paneer or curd adds flavour to the gravy. 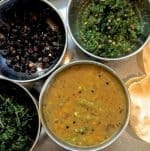 Serve hot with roti or rice and dal. Preparation: Set the potatoes (for the stuffing) to boil. You could use a pressure cooker as you need them soft and mashable. 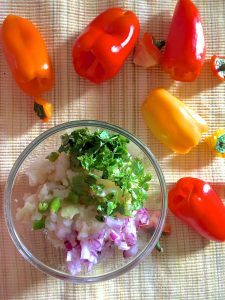 If the bell peppers are large, then you need more potato (approx 50 gms per capsicum ) Slice the onions, tomatoes and green chillies. Mince the ginger and coriander leaves. 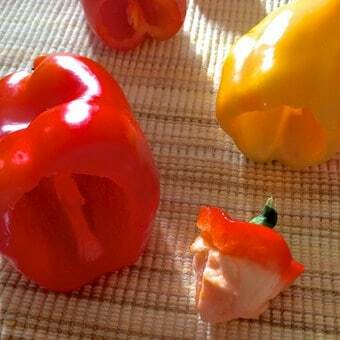 Select small bell peppers – green capsicum, yellow, red, orange peppers or a mix of available coloured ones, preferably of similar size, and as far as possible with not too many bulges and odd corners. Those with a bit of stalk on them would add to the presentation of the dish. Wash and clean well, set aside to drain and dry. To make the stuffing: Peel and mash the cooked potatoes, ensuring there are no lumps. Reserve 2 tablespoons of mash for the gravy. Add a little salt (there will be some salt in the gravy, but you need some for the peppers) Slice onions, mince coriander leaves and green chilies. 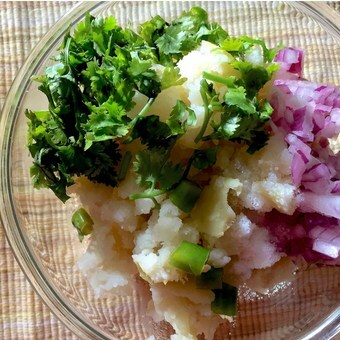 Reserve about a quarter of the onion and coriander leaves for the gravy and garnish, and add the remaining onion, coriander and green chilli slices to the mashed potato. Mix it all well together. Your stuffing is now ready. Divide the stuffing into small portions according to the number of bell peppers used and their size. Larger ones would need more stuffing. Carefully cut away the tops of each, keeping the top and stalk intact to use as a lid later on. Deseed. Lightly coat each capsicum with oil, using a light spray or daub with oil using your fingertip. 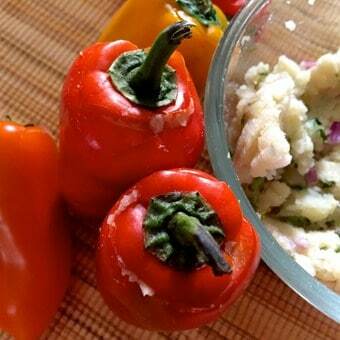 Proceed to fill each capsicum with as much potato mash as it can hold. 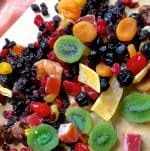 Do it gently using a small spoon and take care not to damage or tear the capsicum while stuffing. Replace the tops of each to fit snugly into the capsicum. If you have toothpicks handy, use them to clip the top to the stuffed pepper. 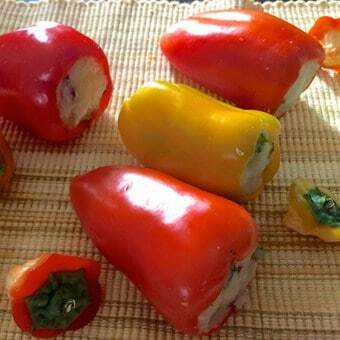 Grill the stuffed capsicum for about 15 minutes - The skin starts changing colour and peeling, becomes soft and the peppers shrink a little. Take them off the grill before it begins to scald and burn. Optional: Heat a little oil in the frying pan and sauté the grilled stuffed peppers. Keep turning them as they fry so that all sides are evenly cooked, taking care while turning them over so that the stuffing doesn’t fall out. You may choose to skip this step and add the stuffed grilled capsicum to the gravy as in instructions below. 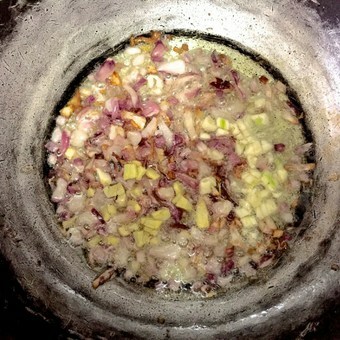 Make the Gravy: Heat oil in a pan and sauté the onions till they become translucent (about 4 minutes on a low flame). Keeping the heat on low, add the chopped ginger and sauté for one minute. Add the garam masala (mixture of spices), turmeric and chilli powder (preferably kashmiri chilli powder as it adds to the colour and flavour of the gravy without making it too spicy (hot). Sauté for one minute or till the raw smell of the chilli powder has gone. 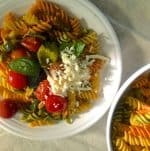 Add the sliced tomatoes and sauté for about 3 minutes. Add salt to taste, keeping in mind that you have already added salt to the mashed stuffing earlier. Add the tomato puree, if you are using it, and saute for about 2 minutes, continuing to keep the heat low. 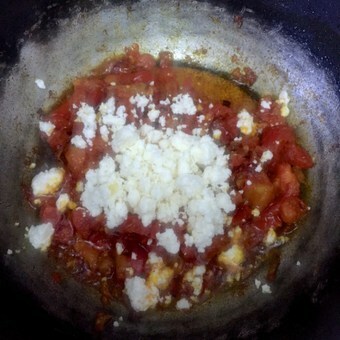 Add curd or a little paneer or some cream cheese. A little water to just cover the gravy. Let the gravy get nicely mixed and smooth but not become a paste. Add a little of the reserved mashed potatoes to make a more robust gravy. 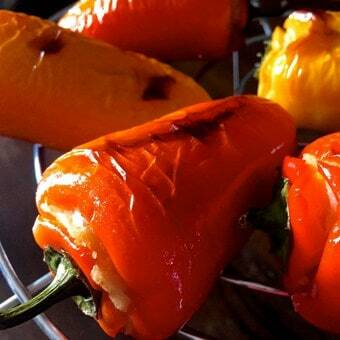 Seat the grilled stuffed peppers in the gravy, turn gently and cover each stuffed pepper with gravy. 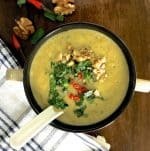 Allow to cook for 5 minutes on low heat, so that the skin softens. Check that the gravy is not getting caught at the bottom of the pan. 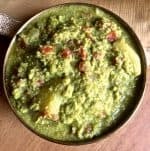 Garnish with minced coriander leaves and serve hot with chappaties or rice and dhal, or all by itself too, with chunks of foccacia or other bread!